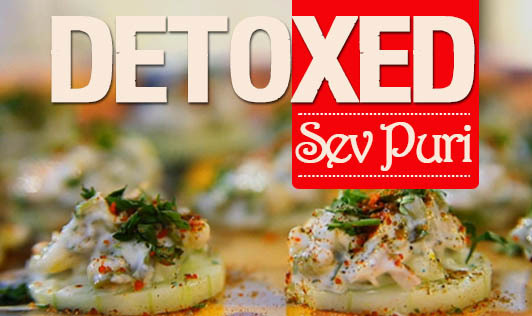 A chaat-inspired starter, which you can pop in without worrying about calories! • Make hung curd by knotting it in a muslin cloth for 30 minutes to drain the excess water. • Boil 2 cups of water in a vessel, add ½ tsp salt and moong sprouts, and let boil for 5 minutes. • Remove from heat, drain and keep aside to cool. • Transfer the hung curd into a bowl and beat until smooth. • Mix in sprouts and chili and keep aside. • Arrange the cucumber slices on a plate. • Top it up with chopped onion, sweet chutney, pudina chutney, curd-sprout mixture, and salt to taste. • Garnish with chat masala, jeera powder, black pepper powder, and chopped coriander, and serve.